The Speed Mic is the open mic night at The Velveeta Room located in downtown Austin Texas on Sixth Street next to some of the best burgers in town at Casino el Camino, and some pretty dang good pizza at Hoek’s Death Metal Pizza. The host changes regularly, but the person who operates the bar and the lights every week is the mayor of Austin comedy himself, Pat Dean. Honestly you’ll be hard pressed to find anyone in the Front Of House that isn’t top notch. Open Mics are one of my favorite show types. It’s a chance to see this art in one of its rawest primal forms. You could see someone have the best night of their life, and then minutes later see someone’s entire being fall out of their body and be crushed under the weight of their failure. That’s what the drink specials are for though. It all balances out in the end, and people are doing what they love. I don’t think you can ever go wrong when you bring together people who are genuinely passionate about what they are doing. The list was 30 people deep and the show was hosted tonight by Carlton Wilcoxson. 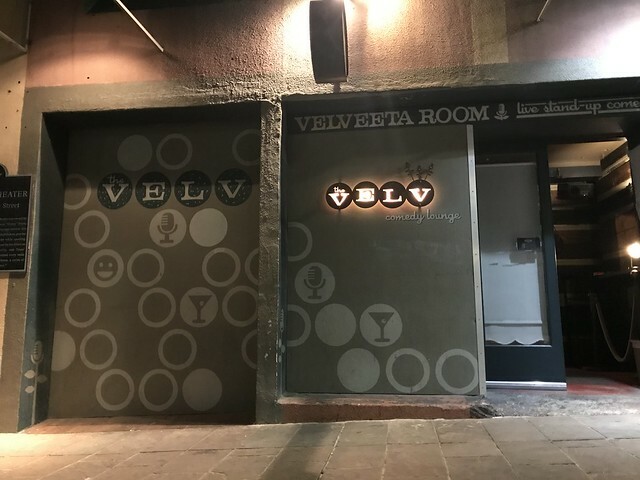 The Velv was the busiest venue on the block for sure. I had to get a seat on the front row about half way through as there wasn’t even room to stand in the back anymore. It’s so exciting to see so many people into comedy. I hope attendance keeps up for Joe Tullar who’s headlining at 9pm today and 9 and 11 pm tomorrow at the Velveeta Room. I’m also pretty excited about a new show at Brentwood Social House. We shall have to wait and see where the wind takes me, as it is pretty chilly outside today. The best place to watch stand-up in town.